Before I start this article, I want to apologize to all the French chefs I am going to enrage. That said, the image we all have of cooking fresh seafood is one of grief and exhaustion. We have to find a location that has the freshest fish, figure out what's in season, soak it, gut it, clean it, shell it, and then cook it just perfectly. Any mistake at any point and the dish is ruined and even worse, you have to make or order something new because you're starving. But these little guys are so good for you and when done correctly are delicious. So let me take you through my version for cooking seafood. After a day in New York City seeing nutrition patients or doing food media stuff, I head home to Bushwick, Brooklyn, trying to shake those little bits of the city off me as I walk up my two flights of stairs. I give my husband a quick kiss on the head as he clicks away at the computer, tell my dog to be quiet because she's barking, of course, and head right to my freezer. I rip open a frozen box of mussels, stab the plastic once, and throw it in the micro for 6-7 minutes. I pour two glasses of wine from my box of wine, yes, you read that correctly -- but more on that in another article. I slice up a baguette, which was delivered to my door using a grocery delivery app I enjoy. Open up my industrialized triple-washed mixed greens and drizzle with olive oil and lemon leaving the remaining semi-squeezed lemon for my mussels. The microwave goes "ding" and I serve up my FULLY prepared seafood dinner. I plate it up and have a French-styled dinner in less than 8 minutes. Not only is this meal tasty but from a nutritional point of view, but it's crazy healthy. There are all kinds of microwavable seafood options out there, but I say start out with the mussels and work your way out to more unfamiliar options like escargot or razor clams. For $2.00 a serving, mussels are some of the most power packed, protein having, and mineral offering menu items you can add to your meal rotation. EPA/DHA. I'm sure you've heard these acronyms before; EPA stands for eicosapentaenoic acid and DHA is docosahexaenoic acid. These long-chain fatty acids are essential to our existence. These omega-3 fatty acids have been linked to almost everything good from decreasing blood pressure, helping to regulate blood sugar, increasing brain function, and decreasing overall inflammation in the body. A 3-ounce serving has over 736 mg of overall omega-3s, 235mg of EPA and 430mg of DHA. Complete Protein. Mussels are considered a high quality/complete protein, scoring 106 on the Amino Acid protein quality scale. A 3-ounce serving is almost one-half of your protein needs for the day and if you're a vegetarian looking to live the pescaterian lifestyle, mussels can fill the amino acid void left by beans. Mussels score very well on the Periodic Table of Proteins. B12. 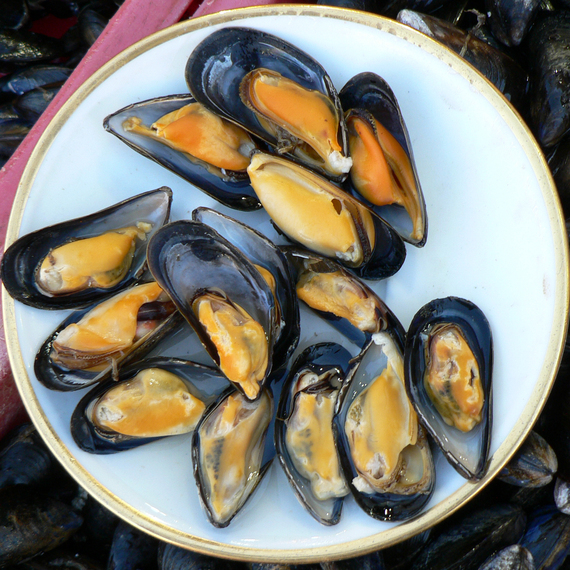 Mussels contain lots of vitamin B12. In a single serving, you get more than your Daily Value. In fact, it comes in at about 340 percent of your daily value. Keep in mind that you only absorb about ½ of the vitamin B12 you ingest from any food and if you're taking heartburn medications you may absorb even less. Moreover, as you age you absorb less of the available B12 in foods, so you need to increase the amount ingested to meet your needs. Mussels can help do that. Now before you say, "This has to be a lie! How can tasty seafood come out of a microwave?!" Understand that I have spent my entire life eating, cooking, and writing about food. I have traveled all over Europe and Asia searching for comforting as well as exotic flavors and I wasn't asked by any seafood company to share this with you. I really just want to inform you about this little nutrition secret hiding right in your freezer section. So, the next time you see a snooty French chef be sure to give him a wink and a nod because you guys now have something in common, delicious seafood menus.